It’s officially the 1st day of the BIKINI SERIES and today we’re diving right in! We really want you to give everything you have in the next 8 weeks. If you’re feeling overwhelmed with work, other priorities or you’re tired and you can’t focus on your workouts… just remember what makes you happy. When you’re in control of your happiness and your body, you’re able to give more love to other areas of your life. To truly succeed and reach your goals from now until summer, you’ll need these motivators: Visualization, Accountability & Rewards! How to Manifest Your Reality with Visualization! We are firm believers that visualization is KEY to reaching your goals and making your dreams come true… we practice it every day! Visualize yourself waking up everyday, grateful and ready to reach your goals. If you don’t believe (and see yourself) achieving what you want, it’s going to be that much harder to get there. One of our favorite ways to do this is to make vision boards ~ this will be the 4th year we’re making these for the BIKINI SERIES! Vision boards set your intentions in your mind while keeping you inspired and focused. You can make one on Pinterest (see some of our team favorites HERE!) or make one for your wall at home. Grab a few fitness magazine, print some photos and quotes online, find photos of places and adventures you want to experience and start putting together images that resonate with what you desire. Focus on both long and short term goals like what you intend to accomplish in the next week, the next month and in the 8 weeks. We promise, you’ll never want to set a goal again without putting your dreams on paper! Close your eyes for 5 minutes after you read this. Imagine yourself making progress everyday. How will you feel when you start seeing results? Visualize yourself happier, more confident and carefree. Visualize yourself in control of your day: what you feed your body, how you react to situations at home and work, how much you smile and remind yourself what you’re grateful for. Imagine yourself this summer being the happiest you’ve ever been. What led you to that place? What decisions did you have to make to get there? We want you to SMILE and truly feel how you will celebrate your accomplishments. Once you have those thoughts in your mind, move confidently in that direction and don’t give up. You’ll feel like you’re on top of the world!! You’re the one in control of your success and we’re here to support you. We’re all dreamers, doers and achievers! Community.ToneItUp.com. If you make your board on pinterest, title it “BIKINI SERIES VISION BOARD #createyoursummer” so we can find them and pin them! The second part of your motivation is Accountability! You have to hold yourself accountable… and we are holding you to it too! If you’re on the Nutrition Plan, you know how important keeping a journal of your nutrition and workouts are. This keep you accountable and honest with yourself. We recommend you use a calendar or notebook to keep track of your healthy meals & workouts! Having an accountability buddy plays a huge role in keeping you strong and on track. Whether you meet a friend every morning for your workout, have lunch break toning session with a co-worker, or Check in with other Tone It Up girls, a support system is essential. You’ll lift each other up when you need boost, share tips, and create a happy, healthy lifestyle together! On Instagram & Twitter ~ use the hashtags #TIUTeam & #BIKINISERIES. You can also create a Tone It Up specific account, like TIU_Anna or Brit_tonesitup, to share your journey! On the Tone It Up Community ~ this is your social media platform for all things health & fitness! We created the Community for this entire team to come together, share tips and motivation. The Community is now better than ever, with hashtags, member contributed recipes and more! Create your Tone It Up Profile Here! 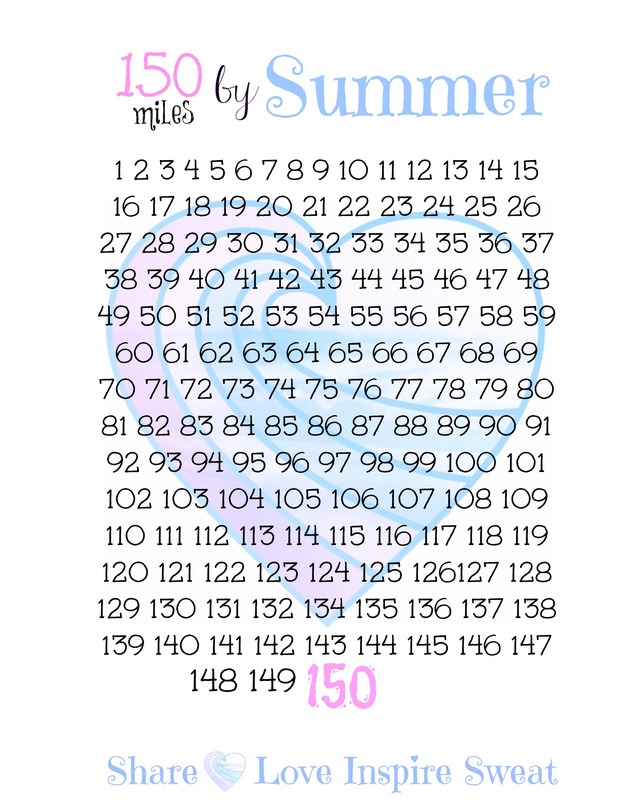 Also, this has become a little tradition :) Tone It Up girl Candice made running charts for your 100 or 150 miles by summer to keep you motivated and accountable to your miles. Read more about your 100 miles HERE! 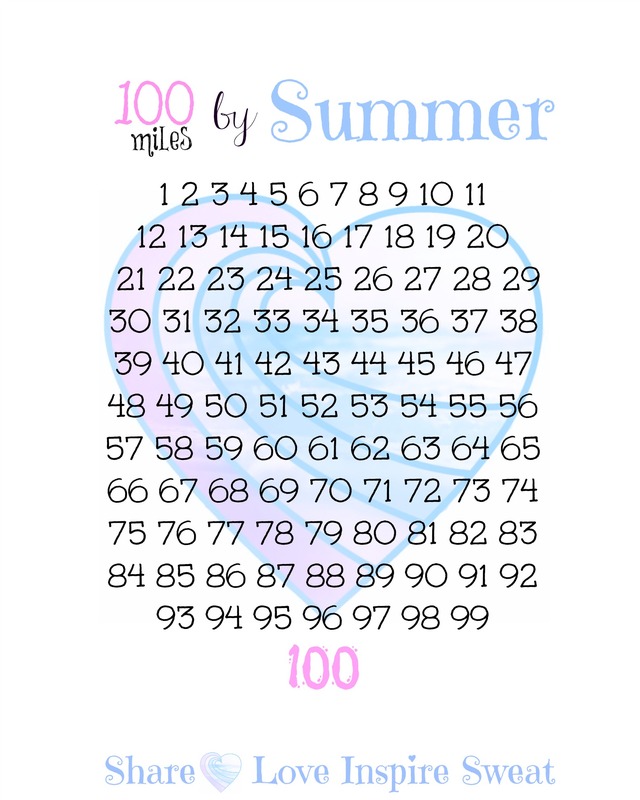 Download and print the charts out below to keep track of your miles! #100bySummer: Right Click and select “Save Link As…” HERE! #150bySummer: Right Click and select “Save Link As…” HERE! Once you reach your goals, what are your rewards? Your confidence, happiness and running through that finish line! What will make you feel more accomplished than anything!? We want you to also reward yourself for all of your hard work ~ not only at the end of the series, but throughout! Reward yourself with things that work toward your goals, not against them. We love these ideas: a bubble bath, a new pair of running kicks, yoga pants, new songs for your workouts, a massage, that cute bikini you keep eyeing for summer, a new hairstyle…you deserve to reward yourself with what makes you happy and confident. It’s important to make them rewards that make you feel accomplished!! Check in winners will be gifted prizes from Beach Babe, Tone It Up, Perfect Fit Protein, Oakley, LG Electronics, Hint Water, Lorna Jane, COOLA Suncare, Boots Botanics and FitBit! At the end of the series Contiki Travel will be gifting 5 of you trips for TWO anywhere, for the BIKINI SERIES Grand Prize!!!! That’s 10 trips! It’s the trip of lifetime. Last year’s winners chose to travel to Costa Rica & Australia. See their incredible adventures here! The BIKINI SERIES happens just once a year! This is your chance to be a part of it and get into the best shape of your life!! Sign UP NOW! Your ultimate fitness & lifestyle challenge kicks off tomorrow! You’re going to unleash your inner Bombshell!! The non-USA girls can also participate in this challenge and win prizes? When will the amazing special design maaji swimwear bikini’so be available! I want to get one before my trip on May 20th!! For the Grand prize, for Contiki, for trip for 2, does both have to be TIU member? If i’m doing this by myself, is a just one trip for 1, or do i get to bring someone non-tiu also? I’m 99% sure it has to also be another TIU member! Good question! I’m interested in this as well. Last year the winners had to be both general TIU members and members of the Nutrition Plan as well. I’m not receiving my start kit in my email. What do I do? Confused. I signed up for the Bikini Series and received my welcome packet already, but I haven’t received my first workout for the day? Will they come every day to my email or be posted on the website? Thanks Michelle. I think I found what I should be working on today (cardio and the upper body video), just thought it was suppose to come via email. There’s SO much stuff on the website and alot of the post are repetitive that it’s easy to get lost. Where did you find the video for today? They send the link for weekly plan. Where did you find this info? I saw the 1st week schedule post but I didn’t see the schedule on it. Just go to Latest Posts and then find where it says “Weekly Schedule”. It has the videos linked, plus printables. Sometimes the email can take a while so just check back every day on Latest Posts to see what’s new! I can’t find a way to print out the 100 miles or 150 miles charts. Anyone know how? Hi Aleya! You can check in on Instagram (I made a separate TIU account – for example brenna_tiu), on their Facebook page, on Twitter, or right on the Community (just login at the top right). Your check ins can be anything from what you ate, to what workouts you did, to how you are feeling! How do you “check in”? how do you enter the contests? by checking in? How do you check in? Are there going to be a new bikini series videos on YouTube as well? I’m a little confused too. Just received my motivation monday at 3:44pm. That’s a little late, since I didn’t open it till 7:30pm when I got home. Very disappointed that it was not in my inbox in the morning since I’m so motivated and excited. I’ve been debating on spending the money on the nutritional program and now I’m a little nervous that I may be disappointed as well.